The weather here in Britain is, at this particular moment, ridiculously warm; it’s so warm that I feel somewhat oppressed. Still, one mustn’t give up and resign oneself to inactivity; the weather won’t last too much longer, so something must be done. For instance, this lemon sorbet has an immediate cooling and refreshing effect which is simply ideal for such tropical conditions. I apologise for making it sound like some form of dermatological medicine, but fear not – it needn’t be applied liberally to one’s exterior. Simply take a scoop, as often as one can manage, and administer orally… this is one delicious sorbet! My addiction to the ice cream machine is now complete; ice cream, frozen yoghurt and sorbet have each been tackled. The thing is, is that it makes the whole process so obscenely simple that the temptation to freeze ‘this’, ‘that’ and ‘the other’ is very nearly unbearable. Honestly, if you haven’t already, go out and purchase your very own machine – it’s sure to save you money in the long run. That is, unless you don’t particularly enjoy frozen desserts of any kind, in which case this recipe probably isn’t for you and you’ve just left 90% of the civilised world dumbfounded. Everyone appears to have their own ideas about how lemon sorbet should be made and taste. Some don’t like it to be too zingy, some add egg white for a little more texture and some include the zest etc… As with most things, I tend to go down the middle with the simplest, purest version of the food in question; it should contain no egg, since it is superfluous and may actually detrat from the taste, and it should have all the punch and flavour available – only then will one have achieved sorbet perfection. Though, if you do decide to disagree with these ideals, one may reduce the amount of zest included and/or increase the amount of water used in relation to the amount of syrup. On with the recipe, enjoy! 1. Most lemon sorbet recipes start with a syrup, this one will be no different. Add the sugar to 200ml of boiling water, allow it to dissolve. Remove from the heat and pour in the juice of 7 lemons and the zest. The amount of zest to be added depends on how strong you want the flavour – I used the zest of 5 lemons, make sure it is very finely chopped. Leave to cool in the fridge. 2. Once the syrup is cooled pour it into a measuring jug and top up with water to around 800ml. Taste it, if it’s to your liking leave it and freeze it according to your ice cream machine’s instructions. 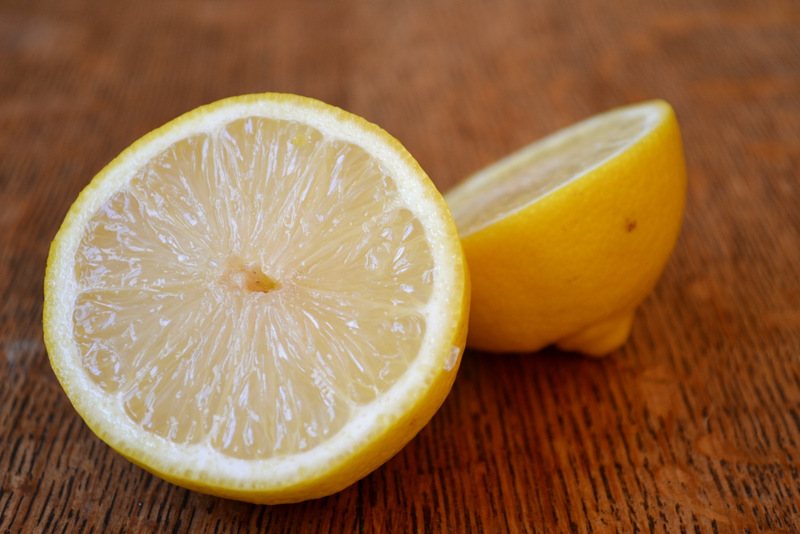 If the taste is a little too strong or a little too weak for you adjust it with more lemon juice or more water. Defrost gently in the fridge before eating. Cost: Lemons are extremely inexpensive at this time of year – I got enough fruit for this for £1, which is very cheap. Since it is also an extremely simple recipe it is a very cost effective way of enjoying sorbet. Indeed, the entire batch should set one back no more than around £1.30! What a refreshing treat! I love your complete surrender to the ice cream maker. Fun little gadget, isn’t it? I couldn’t resist, Daisy! So much fun. Wow….that works out really cheap. If you think how much they charge in a restaurant for a little scoop of sorbet as a dessert!! I know, so good :D. The mark up can be ridiculous. Ha! I am making sorbet for dessert this weekend too. It is like you read my mind. Looks delicious! Haha – I didn’t, I promise! thanks. One of our favorites…great photos, as always..
Love the last photo…it looks so refreshing. We are also enjoying unbelievable warm weather here in Ireland. This is not surprising as we are just a short hop from Wales. 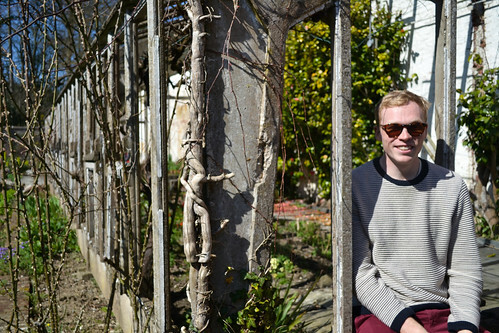 I am sitting in the garden, drinking a pre dinner glass of Muscat and perusing the blogs. The weather usually breaks at 5.00 on a Friday. Not today. This is a very stylish post indeed. Lovely ingredients and lovely photography, as usual. Thanks, Conor! It’s so ridiculously hot! Yes, you are relatively close. I desperately need an ice cream machine. Love this sorbet and lemon is one of my fave flavors. Looks so refreshing and delicious! I love making sorbets, will have to try this! Haha! Thanks! Yes, real lemon is the best way! This looks so refreshing… I have to remember to get some lemons! Yes do, it’s so wonderfully delicious and flavourful. This looks so refreshing! What brand of ice cream maker did you buy? I’ve been thinking about getting one myself – this post may just be the push I need! Thanks! It’s a philips one… quite old actually… stole it off my grandmother :D. I don’t think it’ll matter an awful lot… Definitely get one! Sounds so refreshing and delish! Thanks! I can’t imagine anything more refreshing than this! This is lovely – one of my favorite things. I’m looking forward to trying this. Thanks for stopping by again! I finally did the thumbnail up larger of you and you look so much like my dear 3rd cousin Bill who lives in New Jersey, up in Yankee land, it tain’t funny. Love your blog. I made this this weekend for a holiday (Labor Day) cookout. It was a rip roaring success and several people asked for the recipe. I was happ to pass it along and how I obtained it. It truly is a lovely dessert and is going to become one of my go-tos. Awesome! Thanks for passing it onto them – it’s a truly amazing sorbet. I just can’t wait to try another sorbet… perhaps a last hurrah for the summer! Maybe a last hurrah for the summer….but I can tell you, it is going to be a major hurrah for our Thanksgiving dinner, and Christmas, and Easter…..and times in between. I really enjoy sorbets and love the flavor of lemon. 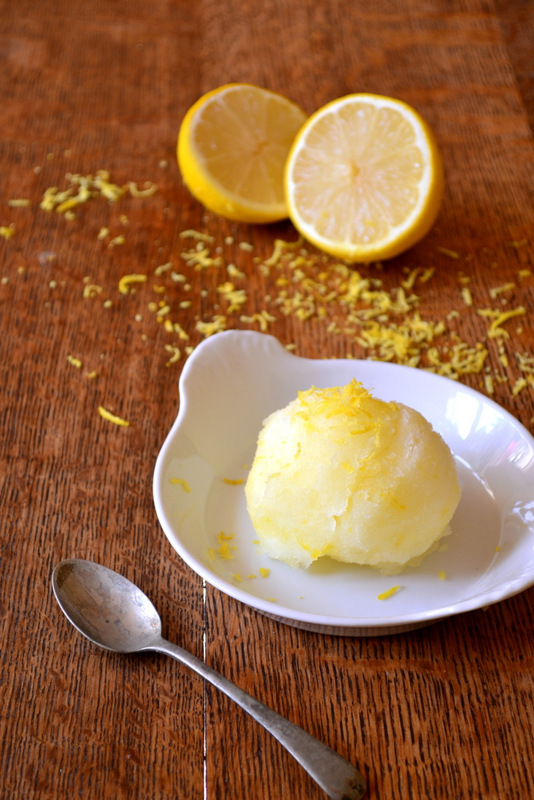 this is the best lemon sorbet recipe I have come across. I cannot thank you enough for sharing it. Just know it is going into my Hall of Fame Recipe book. And since I have the pic from your blog, I can cut and paste the credit for it accordingly, because I do like to do that. I have also forwarded to my cousin Billy to see what he thinks about having a doppleganger across the pond. Trust me, you have the credit for it. You deserve it! I’m getting ready to post the 11/16 Club in a day or so. You might find it funny, especially the parts about my cousin Billy. Thanks! I shall be on the look out! This looks so wonderfully refreshing! I just adore lemon too! Thanks! Lemon is incredible, especially on very hot days. You have made me realise I really do need an ice cream maker! I’ve been toying with the idea of getting one for years..I may have to start dropping hints to Mr T 😉 I love sorbet and this looks very refreshing. You do! They are very cheap. I’m glad you like the look of my sorbet! Beautiful photos, Frugal! Funny, too, that you’re sweltering just when our weather has cooled down for the first time in months. I’m glad your liking my photography – I feel like I’m getting better too. Plenty of room to improve though. Our lemons are almost ripe and we have had two days of weather warm enough for swimming. Perhaps I’ll make this soon. You should! Definitely worth it, Sharyn. I wish I had a scoop of that right now! It looks like just the thing for a hot summer night. It was! It cooled me down very well indeed. Wow! I have been on a big citrus kick recently, and this looks wonderful! Thanks! There’s nothing like a little citrus for a bit of refreshment. Really can’t beat a good lemon sorbet on a hot summer’s day. Excellent pics also! Awesome photos, man! Sounds like a really great sorbet. Love all the zest. Thanks! The zest is what perfects it! Thanks! You can make it without. Simply freeze it, but break it up every hour with a fork. yay for warm weather! this sounds so refreshing and like it would hit the spot! Indeed! It definitely hit the spot! This looks delicious. Will definitely be getting an ice cream maker for summer! Thanks! You definitely should – a truly worthy investment. 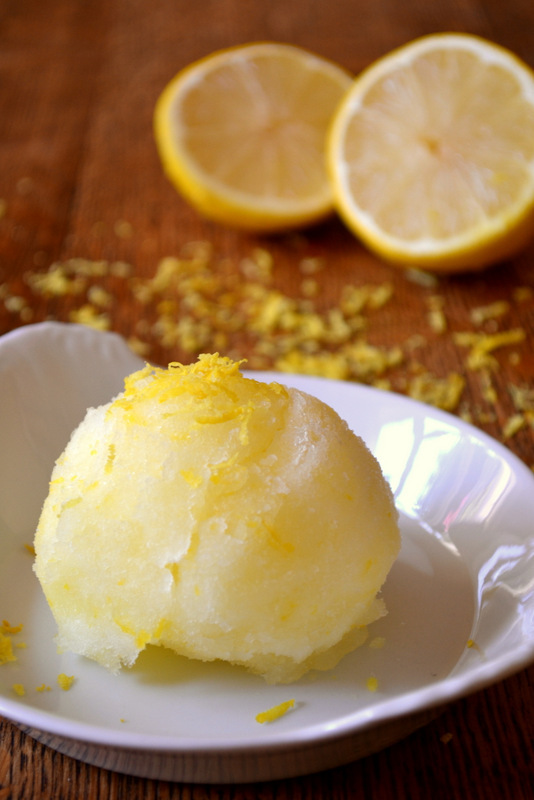 Your sorbet looks so refreshing, and lemon is the ultimate flavour for an icy treat on a hot summer day. I tried a Meyer lemon sorbet last winter and for some reason it turned out bitter. Time to brush off that humbling experience and take another run at lemon sorbet. Thanks for the inspiration! Thanks! Hmm, did your syrup have enough sugar in it?! Anything citrus makes my tastebuds tingle… in a good way! Not to be crass, but have you tried original source shower gel? I’ve heard it makes certain parts of one’s anatomy tingle… apparently the lemon one is best – it contains the juice of 5 lemons I think. Don’t eat it. Haha – it can be sunny and cold :D. I’ll so a soup ice cream?! I definitely need to get an ice cream maker because that looks so good! Beautiful photos! You do! They are very cheap! Haha! I like that you have it alphabetised… Purity is key when making things like this. Simplicity requires purity. This would certainly see you through! 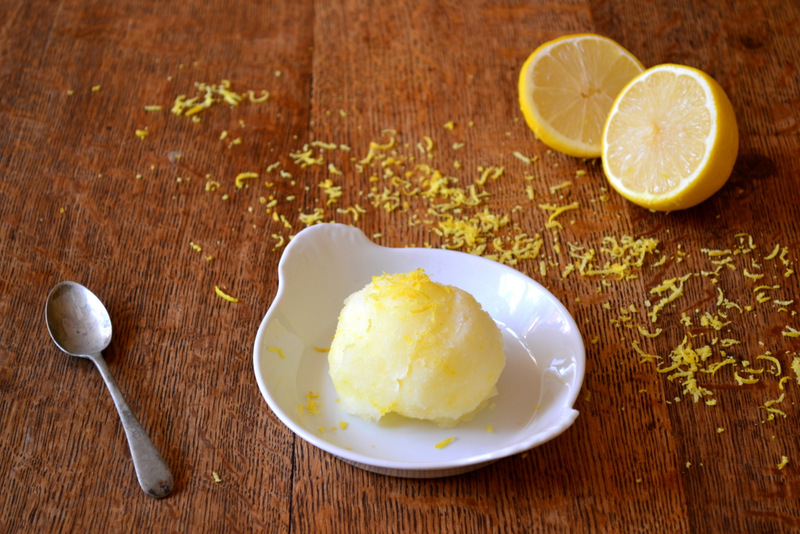 I agree – sorbet should be all about flavour, and in the case of lemon, full of zing. I was in Las Vegas last week (the desert in August, what was I thinking?!?!) and I’m wishing I had a giant bowl of this to carry around with me at all times. It looks so refreshing. Exactly! That must have been very warm… it was so refreshing. Oh my, thanks for keeping your promise to post this! Beautiful! Thanks for sharing! I’ve gone all summer without breaking out my ice cream maker…might have to for this one. No problem! I think you better had! This sorbet looks mouth-puckeringly good, yum! Thanks! It was truly delicious.